TheUsual/PHP exists to provide a fast, free, user-friendly web browser viewing and maintenance interface for MySQL databases. It runs on your own computer under a web server like Apache or IIS, on a dedicated intranet or internet server, or on a remote hosting server (dedicated or shared) running MySQL 4 or preferably 5&Up. There is now just one current version of TheUsual/PHP, for the mysqli PHP API. The mysql PHP API has been deprecated and will soon disappear from PHP; our last version of TheUsual for the mysql PHP API was 1.90. To download TheUsual/PHP, visit http://www.artfulsoftware.com/theusual.html and scroll to the bottom of the page. MySQL 4 or later for one-table browsing, MySQL 5.0.7 or later for master-detail browsing. The latest production or release-candidate version of MySQL is usually best. PHP 4.3 or later running in a web server, usually either Apache or Internet Information Services (IIS). The dangerous and deprecated PHP setting register_globals must be off. Your instance of PHP must be configured to communicate with MySQL. The mysql PHP API has been deprecated and will be removed. The last upgrade of TheUsual/PHP for that API, theUsualPHPmysql.rar, was version 1.90. Use the mysqli API instead, and the version of theUsual for that API, theUsualPHPmysqli.rar. into a conveniently named folder (eg, theusual ) off the Document Root of your web server (for example /var/www/theusual, /apache/htdocs/theusual/, or on Windows with IIS, c:/inetpub/wwwroot/theusual/ ). into c:/php/includes if available, or failing that, in a directory that is not web-visible and that is visible to PHP. S3. In theusual-login.php, edit the values of $host, $user and $pswd for your MySQL setup. S4. In your browser run http://localhost/theusual/theusual_start.php, and bookmark the page. 1. Be sure to enable read-write sharing for IIS_IUSR for TheUsual's folders and subfolders. 2. Since Windows 7, IIS authentication is byzantine. If PHP scripts like TheUsual fail with an error like "You do not have permission to view this directory or page because of the access control list (ACL) configuration ...", from Start run inetmgr, click on the top level in the left navigation panel, select Authentication in the IIS middle panel, right-click on Anonymous Authentication and select Edit, and in the resulting Edit Anonymous Authentication Credentials dialog, click the Application pool identity radio button. Incredible, but there it is. 3. To allow imports bigger than 30MB, try this: select the top item in the left inetmgr navigation pane, click on Request Filtering in the middle pane under IIS, select Hiodden Segments, right click on Web.Config, from the context select Edit Feature Settings, and change Maximum Allowed Content Length to a value that suits your needs. Then restart IIS. If IIS doesn't allow big uploads, you will have to FTP or otherwise copy them directly into TheUsual's uploads folder. W1. In your site's main web document folder (eg /home/your_site_name/public_html), create a folder named theusual. This folder will hold your web instance of TheUsual. W2. Create a folder outside your web document tree, ie a folder that is not available via public_html, for example home/your_site_name/theusual. If your hosting provider does not provide access outside your document tree (unbelievably, some don't), get a better hosting provider right away! W3. Visit http://www.tools.dynamicdrive.com/password/, and there enter the desired username and password for your instance of TheUsual. Usually, this will be the username and password provided by your hosting provider for access to your MySQL database. For 'Path to .htpasswd file', enter the full path to the folder you created in step W2. Click Submit. to a plain text file named .htaccess in the folder you made in step W1. substituting the host, username and password values provided to you by your hosting service. right below the call to session_start(), making sure that /home/your_site_name/theusual exactly matches the path to the folder you created in step W2. W8. Copy all files listed in step S1, including your newly modified copy of the_usual_start.php, into the folder you created in step W1. W9. In your browser run http://www/your_site_name/theusual/theusual_start.php, bookmark the page, and enter your username and password. set as environment variables named HOST, USER and PSWD respectively. If you use theusual-login.php, remember that PHP include files can be in the php-includes path, for example in the c:/php/includes folder, or in the current folder, but keeping such include files in the current folder is a security disaster on an internet-visible server. Versions 4.x of PHP use 3.x versions of MySQL client modules, but passwords created with MySQL since version 4.1 use an authentication protocol which earlier MySQL clients cannot decode. If you are using PHP 4.x, the password of any user of theUsual.php must have been entered with, or edited to OLD_PASSWORD('password'). Theusualcall.php is a simple frontend for selecting and running any instance of TheUsual you have access to, against any MySQL database server you have access to. where the first three lines specify logins available to either of the group=lan instances of TheUsual defined above, and the last line tells theusualcall.php to pass only the mysql name to the instance of TheUsual at the myclient site, and not to send user and pswd with that call (on the assumption that mylogin.php will collect and authenticate those values). theusualcall.php ignores lines in theusualcall.ini that don't begin with 'theusual' or 'mysql'. A sample theusualcall.ini is provided. Any number of independent instances of TheUsual can run simultaneously in browser tabs, because TheUsual implements the session setup described in Chapter 12 of Get It Done With MySQL 5&6 and under MySQL and PHP | Basics | Session setup at http://artfulsoftware.com/infotree/mysqltips.php. On load, TheUsual offers a list of databases for which you have privileges. Once you select a database, TheUsual puts up a dropdown table selection list, and a saved queries dropdown for the current database if you've enabled this option and if there are saved queries. Below these dropdowns you see a dashboard offering custom query, import, database browse and other command links. If you make a choice from the table dropdown, TheUsual brings up a paged datagrid display of that table with order-selectable headers, and a statusbar permitting selection of First/Previous/Next/Last row groups and rows-per-page selection. You may add, edit, copy or delete rows for any table with a primary key. If the selected table uses an ACID-compliant storage engine like InnoDB, and if other tables in the current database have foreign keys referencing that table, the dashboard offers a dropdown detail table selector. If you select a detail table from that dropdown, TheUsual displays a second grid with detail rows matching the current row of the master table. If that child table is in turn the parent of another table, Go commands in that grid select that detail table as the master table in a refreshed page. MySQL 5 implements Views, so when run against MySQL 5 or later, theUsual/PHP lists Views as tables. To create a View, run a CREATE VIEW statement as a custom query. To run a View, select it from the Tables dropdown. and it retrieves such queries for editing and execution. and a Save button appears on the custom query form. To manage your saved queries, select theusualviews from the Tables dropdown for the appropriate database; browse and edit it as you would any other table. For convenient code editing, use the Settings panel (in the Browse database dashboard) to set text format to preformat. Do not try to send SQL scripts bigger than about a quarter of a megabyte through Custom Query. The custom query module is meant for scripts that are small enough to be meaningfully interactive and which may display SELECT results; it bogs down with more than 250 KB of input, and depending on the browser, can grind to a halt near 1MB. open such a file that's already in the uploads folder off TheUsual's current working directory on the server. The Import module creates the uploads folder if it does not exist, logs file uploads to theusual_uploads.txt, and logs upload errors to theusual_uploads.err. If the import file is too big to be uploaded through the browser (e.g., the IIS 7.5 limit is 30MB unzipped, and difficult to change), you'll need to FTP or otherwise copy the SQL command file directly into the uploads folder. The module can handle files that contain SQL text, and zip, gzip, bzip2 and rar archives of SQL text. Most PHP installations support zip and gzip. Bzip2 requires PHP configuration using --with-bz2. The PECL rar module is unstable with PHP 5.2 through 5.4 (if you find a rar plugin that works with those PHP versions, please let us know). The import form also sets sql mode, character set, file deletion policy, and whether to try to determine that the file actually contains SQL before executing any commands from it. Beware that several php.ini settings govern import file size and script execution time: edit php.ini, or invoke ini_set(), to set max_file_uploads, max_execution_time and max_input_time to limits that accommodate your largest and longest imports, and post_max_size and upload_max_filesize to zero if you can live with no limits, or to values you can live with. The internet wasn't designed to display results of long batch jobs in real time. The MySQL client program isn't so good at the job either: results fly by faster than they can be read. The Import module is meant to handle potentially huge Inserts, so it shows just the first 80 characters of each SQL command it executes, alog with the result. Even with that, screen output may be massive. How will a web browser respond? Browsers do their own output buffering. We've no control at that level. Under Apache, output_buffering in php.ini is determinative; it defaults to 4KB, so flush commands in display code keep the user informed about how execution is proceeding. substituting your values for theUsual_mysqli and PHP52_via_FastCGI. Restart IIS. Per page: A rows/page dropdown selector appears on the dashboard when the query is pageable. Possible values are 5,10,20,50,100,500,1000,2000,5000. To change these, edit $pagelens in theusual.php. Prev, Top, Next, Last: Display the prievious, top, next or last <per page> rows returned by the current query. Detail table: This is a dropdown selection list of ACID-compliant tables in the currently selected database with a foreign key referencing the currently selected table. Up to version 1.89, TheUsual could display one master-detail table relationship. Since version 2.00 (mysqli version only), there is no limit to the number of cascading master-detail relationships. Master-detail relationships without declared foreign keys: Several MySQL storage engines offer no support for foreign keys, yet management of data in such tables often needs master-detail logic. TheUsual helps with this by letting you add, to the above child tables list, master-detail table relationships without declared foreign keys. It does this by storing such info in a "meta-data" table. If you have database creation privileges and don't have a theusualsys database, consider creating create one and using it for this feature. Having set it, be sure to create the database. If you have access to just one database, and no privileges to create other databases, you can still use these informal foreign keys by setting the database for them to the DB you are already using. Set it in theusual_soart.php as above. The next time TheUsual runs, it creates a table named theusualfks in the database you've specified. You can use TheUsual (or any other MySQL client) to add rows to this table specifying master-detail (parent-child) table relationships. Beware that TheUsual does not (yet) validate parent-child entries in theusualfks table; it just tries to execute them as if they were real foreign keys, and reports an error if the specification is incorrect. If the detail table itself has a detail table, the leftmost column of each detail row shows, in addition to Edit, Ins, Copy and Del options, a Go option that makes the current detail table the master table in the next browse, which will be of the page containing the selected row. Use Go to daisy-chain down any number of cascading master-detail table pairs. Every row offers options to Edit, Ins(ert), Copy or Del(ete) that row. Clicking on Edit puts the current row in edit mode, clicking on Ins brings up a new row for editing, and clicking on Copy brings up a new row which is a copy of the current row for editing. Finish an Edit, Ins or Copy cycle by clicking Save or Cancel. Automatic foreign key lookup dropdowns: Since v1.57, during row edits, for columns that are foreign keys in ACID-compliant tables, and also for TheUsual's user-defined foreign keys, TheUsual automatically puts up a dropdown for selection of a key value from the referenced table. In that dropdown, beside the key column, it also displays a (VAR)CHAR description column, if it can find one. You can tell TheUsual what description column to use if you enabled TheUsual's user-defined foreign keys: edit the theusualfks table in the database specified by $_SESSION['sysdb'] = 'admin', and in the row for that foreign key, set the value of the column named referenced_desc_column to the desired SELECT expression (beware: TheUsual doesn't verify your syntax!). ... in theusual_start.php. Then when TheUsual runs, it opens or creates a table named theusualplugins in that database. Install an input plugin by adding a row to that table specifying coltype, onfocus, jsfile and cssfile, and optionally specify script and onblur. As a demonstration example and convenience, if the theusualplugins table is empty and if TheUsual can find the files calendar.js and calendar.css in the current folder, it installs a plugin calendar popup for date inputs by creating and populating a theusualplugins row for it. To import some other plugin, bring up the theusualplugins table in TheUsual, and add and populate a row. Selecting Custom query from the dashboard brings up a custom query text control that's resizable in FireFox, Chrome and Safari, and an Execute button. If saved queries are enabled, it also has a query name control and a Save button. It supports CREATE PROCEDURE | FUNCTION | TRIGGER, for each of which, if the routine has more than one line, you should specify an alternative delimiter before, eg DELIMITER go, and after, eg END; go. The mysql interface does not support multiple resultsets; TheUsual/mysql works around this by closing and reopening the connection for each query, but this workaround fails if the multiple queries are within a stored procedure, so with the mysql API, stored procedures that execute multiple queries will show just one resultset. The mysqli interface does support multiple resultsets, and TheUsual/mysqli shows them all even when they're from within a stored procedure. When executing multiple-query scripts, remember there's no paging. Run big scripts (250KB or more) through the Import module. A Chart prompt appears on the dashboard if TheUsual can match the data in the current datagrid to a type of chart it knows how to draw. TheUsual can now display, on the fly, nine kinds of Google Visualisation API charts—Area, Histogram, Line, Smoothed Line, Motion, Org (Tree), Pie, Pie with Percentages, and Scatter. These charts can use [VAR]CHAR, numeric and DATE values; BLOB, TEXT, ENUM and SET values are ignored. When customising queries for these charts, remember that MySQL functions like FORMAT() return strings; to make strings usable as numeric values for a chart, use CAST( FORMAT(...) AS DECIMAL[...]). Area chart: An area chart colours the space between the value line and the next lowest value line, or in the case of the bottom line, the x-axis. An area chart is available for the current query if its first result column returns a string, date or numeric value, and if there is at least one additional numeric result column. Histogram: Added in 2.10. The first column found in the query is distributed along the x-axis. Following numeric columns are scaled up the y-axis. Line and LinePlus charts: These plot y-axis value changes against x-axis values. The simple line chart displays raw values; the "Line plus" chart displays moving averages. Line charts are available for the current query if its first result column returns a string value, and if there is at least one additional numeric result column. LinePlus is a smoothed line plot. Motion chart: Invented by Hans Rosling, a motion chart makes a mini-movie of change over time, with many user-settable runtime options. A minimum motion chart needs a query result with a first string column; a second column that is a year integer, a date, a string specifying year quarters in the format YYYYQn, or a string specifying year weeks in YYYYWnn format; and at least one numeric result column. See the example below. Org/Tree chart: Draw an edge list tree. It requires at least two table columns, one for child values, one for parent values. Before v1.85, the first column must be the child column and the second column must be the parent column; since v1.85, the columns may be in parent-child or child-parent order. Each distinct parent column value must occur exactly once in the child column, and each child column except the root node should have exactly one parent (otherwise, the hierarchy is not a tree). An optional third string column can specify tooltip text. 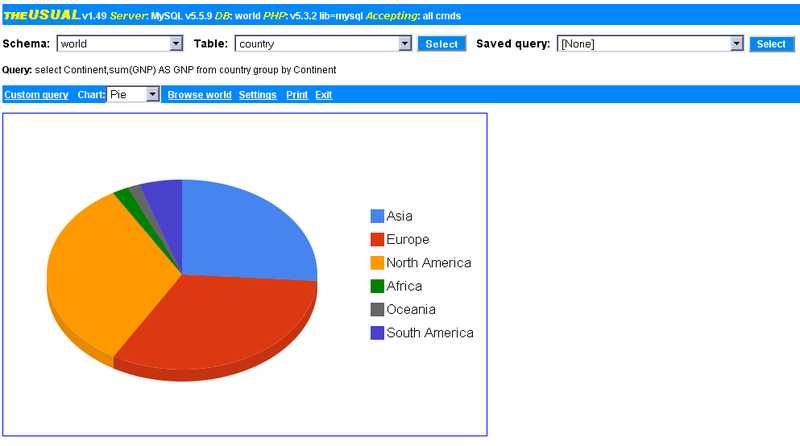 Pie charts: A pie chart needs a query result with a leading string column and a numeric column. "Pie plus" adds display of percentage values . Scatter chart: Ths needs two or more numeric columns. The first is plotted on the x-axis, and the others are colour-coded on the y-axis. To draw a chart, TheUsual has to write out the data to be charted in a format that the Google Visualization engine can understand, so charts work best with aggregating queries that keep down the rowcount. Area charts, Histograms and Scatter charts can handle up to 10k rows; Org charts can handle 5k rows but are best with a few hundred at most; Line charts can handle 2k rows. Pie charts become unreadable with much more than a dozen rows, though the module will accept 50. Print: Version 1.44 introduced a Print option to send browsed data to the printer of your choice. Refresh: If your most recent custom query added or dropped a database or table, use this option to refresh the Database and Table dropdown menus. The Browse <databasename> prompt in the dashboard brings up a view for administering all objects in the currently selected database. It includes one-click whole-database backup and options to Analyze, Check, Optimize, Repair or Drop tables. Settings: This form allows you to toggle text/blob formatting, stripping of HTML tags from input queries, displaying live urls in text data, and use of information_schema for metadata (this latter provided because the more databases and tables there are on the server, the slower information_schema is; the first information_schema access can take minutes on servers with dozens of databases and thousands of tables). The default setting of $_SESSION['use_info_schema'], which determines whether to use information_schema for metadata, is FALSE because MySQL queries on information_schema are so painfully slow when there are many databases and tables. The default setting of $_SESSION['views'], which allows TheUsual to save queries in a database table and retrieve them for execution, is TRUE; and the default setting of $_SESSION['sysdb'], the name of the database where TheUsual will look for its table theusualfks storing data-driven non-InnoDB foreign key specifications, is sys to v2.18, then theusualsys. Some setting defaults can be changed by editing theusual_start.php. In v2.20 the default separator char for passing multi-column keys was changed from "|" to "ʃ" when running with a Utf8 variant charset. This caused key readability problems on some system,s so the change is reverted in 2.21. Backup: Since v1.45, database backup is available in the database administration browser. It assembles, then offers for download, a file of SQL commands to recreate the tables, views, data, stored routines and Triggers of the current database. It writes its file to the current web folder, offers to download the file to the client, logs the file operation, and when the downlaod completes, it deletes the dump file. If the download is declined or if it fails, the file stays on the server. Under Apache this is routine. Under Windows and IIS, it can require two additional steps: make the server folder's security tab visible, then use the Security tab to enable writes to wwwroot. Open My Computer, click on Tools | Folder Options and then on the View tab. At the bottom of the list uncheck 'Use simple file sharing (Recommended)'. Now Windows Explorer shows the Security tab in the Properties context menu for every folder. In Windows Explorer, right-click on wwwroot, select the Security tab, select the Internet Guest Account ([username]/IUSR_[username]), check Write and Modify, and press OK.
2.31 Corrected calls to SQL formatter. 2.31 Quote new reserved word 'Rows' in information_schema db stats query. Improved SQL formatter. 2.30 Corrected transactqry() retry handling, support for specifying retry count, charset matching in insert and update scripts. 2.29 Corrected saving of query updates, setting of defaults in input forms. 2.28 Faster rowcounts. Transaction support for InnoDB, XtraDB, TokuDB, PBXT inserts, updates, deletes. 2.27 Restored functionality growing last data page size up to page limit. Increased availability of Edit Query option. Disabled resetting of limit clause to default when executing a saved query with a limit clause. Work around 8 vs pre-8 no_auto_create_user incompatibility processing mysqldump scripts. Lengthened max_execution_time. Corrected master-detail display glitch. 2.26 Renamed row-find UI command name to 'Goto'. Disabled html autocomplete for form fields using plugins. Reworked child row code for cascading parent-child browse instances. 2.25 Added support for Common Table Expressions. Improved rowcount performance. 2.24 Changed dump delimiter for stored routines. 2.23 Backtick newly-reserved-word column names in dumptables(). 2.22 Allow for MariaDB in version check. Allow limits up to 5K rows. 2.21 Some fixes to master-detail cascades. Experimental: for editability accept unique keys in place of primary keys. 2.20 Scale display of width-unspecified pics for mobiles & non-mobiles. Changed default separator char for passing multi-column keys in utf environments to "ʃ". 2.19 More corrections to restoration of form data after save error. Handle quotes in keys. 2.18 Var name changes for PHP 7.1. 'System' is a reserved word in 8.0.3, default system DB name now 'theusualsys'. 2.17 More improvement to live URL display. 2.16 Corrected handling of primary key strings containing URLs, improved display of live URLs. 2.15 Corrected handling of user queries with nested subqueries. More custom queries now chartable. 2.14 Backticked new 8.0 reserved words. Corrected connect error handling. 2.12 Corrected pseudo-foreign-key retrieval from theusualFKs table. 2.11 Corrected restoration of form data after save error, handling of semicolons terminating custom queries. 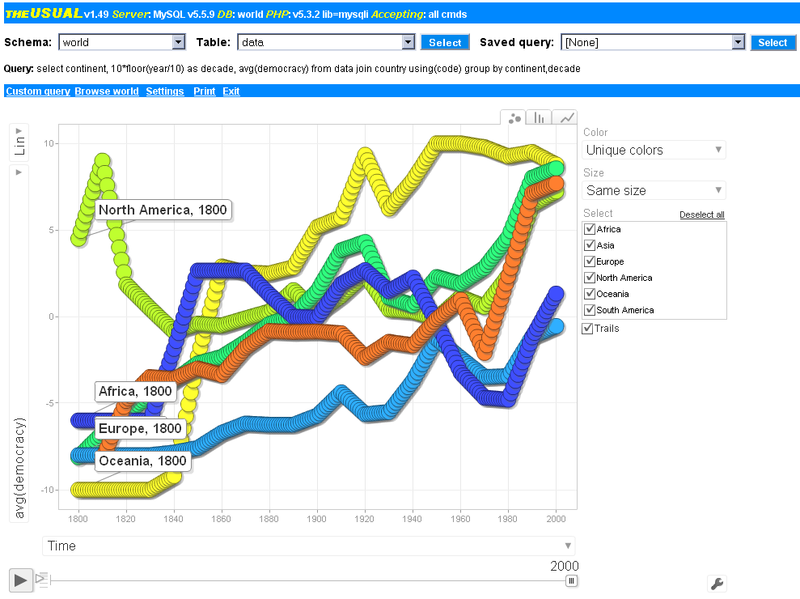 2.10 Added Histogram charts, updated Google Visualization API call. Fixed bug in saving query edits. 2.08 Corrected display of Show Create Table in schema browser. 2.07 PHP before 5.4 chokes on some !empty() calls, changed to !strlen(). 2.06 Corrected edit link after non-PK Find. 2.05 Corrected master-detail row synchronisation. Don't override existing Limit clause in a saved query with the current setting. 2.04 Corrected row pointer after Insert, form value restoration after Insert or Update failure. 2.03 Added Find support for '%' wildcard. Corrected url display. 2.02a Corrected misplacement of textarea edit width spec. 2.02 Find option enhanced for search on any column in base tables and updatable views selected from the Tables dropdown. 2.01 Corrected bug introduced in 2.00 preventing table DDL display in database browser. 2.00 Master-detail table browsing support for unlimited no. of cascading master-detail relationships. 1.90 Corrected handling of multiqueries that begin with a delimiter directive. Note: this is the last version of theUsual for the mysql API; from here on in, only the mysqli version of theUsual will be upgraded. 1.89 Changed the default name of the schema for server-wide settings from "sys" to "system" to accommodate MySQL 5.7 use of "sys" as the name of an endogenous schema. 1.88 Fixed parsing of illegal schema names. New setting liveurls activates urls in displayed data. 1.87 Option to filter HTML in all form strings. Fixed bug that could switch the current table on cancelling a theusualviews edit. 1.80 Corrected Backup download switch. 1.79 Corrected EOL handling in imports. 1.78 Added an Import module, and settings forms for import and backup. Fixed some display glitches. Optimised multiquery parsing. Added a GoTo command for each table & View in the database browser. 1.77 Corrected handling of multiple multiquery delimiters. 1.76 Modularised mysqldump routine, added table-export option to database browser. 1.75a Improved error handling. Corrected delimiter block handling in multiquery module. 1.74 Corrected next-result error in mysqli multiquery module. 1.73 Added lightweight query formatter to make CREATE VIEW results human-readable. 1.72 Corrected implementation of user's text display choice. Sort information_schema to bottom of DB list. 1.71 Corrected display of multiple resultsets from stored procedures. 1.69 Corrected handling of blank numeric values in forms. 1.68 Improved handling of missing theusualviews table. 1.67 Corrected parser code triggering warning in some foreign key checks. 1.66 Corrected handling of UNION queries. 1.65 Corrected minor error in reading user-defined foreign keys (theusualfks) table. 1.64 Corrected parsing of complex multiqueries. 1.63a Corrected typo in parentkeys(). 1.63 Removed irrelevant links in database browser. 1.62 Corrected Drop Table bug in mysql version of Browse Database. 1.61 Added automatic dropdowns for parent keys specified in theusualfks. 1.60 Automatic dropdowns and initialisation of child foreign key columns to parent key values when adding a row in detail datagrid. 1.59 Improved handling of limits in saved queries, and of missing 'sysdb' database when it has been specified. 1.58 Corrected recently introduced problem in definition of some custom query columns. 1.57 Added automatic foreign key dropdown lookups. Corrected timezone detection. 1.56 Added smoothed line charts, and pie charts with percentage display. Corrected View ordering. 1.55 Corrected handling of database-specific routine privileges for backup under shared hosting. 1.54 Corrected handling of INSERTs and UPDATEs of blank BLOB and TEXT values. 1.53 Corrected bug that prevented browse of performance_schema. 1.52 Corrected initialisation of Saved Queries dropdown. 1.51 Corrected handling of user dropping the current database. 1.50 Corrected handling of queries, Views and saved queries for charts. 1.49b Do not automatically add an ORDER BY clause to a MySQL View. 1.49 Does on-the-fly Google Area, Motion, Pie, Org and Scatter charts. Corrected query saving. 1.48 More key-handling workarounds for servers that still set magic_quotes_gpc. 1.39 Added dynamic character set setting, coordinated with Set Names. Corrected column headers. 1.37 Added Go option in detail browse to cascade master-detail chains. Updated default settings. Smoothed error handling. 1.36 More text formatting options. No default ORDER BY clause in a query on a View. Corrected multi-key deletion & subquery parsing. 1.29 Size limit setting for text and blob display/edit. Timestamp default handling improved. 1.05 Ins/Edit/Copy/Del/Save/Cancel buttons compressed. Accept NULLs to nullable columns.